"Caterpillar" redirects here. For information about the caterpillar in Gusty Garden Galaxy of Super Mario Galaxy, see Big Green Caterpillar. Wigglers are a species resembling caterpillars. They first appear in Super Mario World, where they are yellow and slowly moving when calm, but turn red and run angrily about quickly if jumped on. Wigglers, in all their types are easily identifiable by the characteristic flower or other plant growing from their head, which can lose their petals if Wiggler are enraged. Wigglers appear usually as enemies, but some are allies and even playable. In Super Mario World 2: Yoshi's Island, a fully grown Wiggler variant known as a Flutter makes an appearance, confirming that Wigglers are indeed caterpillars. Wigglers seem to transform into Flutters immediately (though in some cases as in Mario Power Tennis, temporarily) without going through a cocoon stage as typical real-world caterpillars do. On the other side, Squigglers appear to be a younger variant of Wiggler suggested by its appearance in Mario & Luigi: Bowser's Inside Story, though this is not confirmed. 1.11.1 Mario Kart: Double Dash!! 3.8 Who is your Mushroom Kingdom BFF? Wigglers make their first appearance in the Forest of Illusion of Super Mario World, though only in Forest of Illusion 1. Wigglers also appear in the bonus level Outrageous. When jumped on, Wigglers turn red as they get angry and start moving faster, aggressively chasing Mario or Luigi. Wigglers cannot be defeated with standard Jumps. They are also immune to the cape spin from Cape Mario (with the Cape Feather). However, they can be beaten using a Super Star or a thrown object (such as a Shell, a Galoomba or a Grab Block); they can also be eaten by Yoshis. Wigglers are also used in a glitch that allows the player to obtain 9,999,990 points very quickly. In Super Mario 64, a Wiggler appears as a boss in Tiny-Huge Island. To reach Wiggler, Mario must go into Tiny Island and ground pound the pool above its house at the very top of the Island, then enter Huge Island and fall through a small gap that cannot be reached in Tiny Island. Inside, Wiggler is angry with Mario because he has flooded its house, and claims he has had bad luck ever since he acquired his Power Star. After two stomps on its head, the Wiggler is more furious and storms around; after one more, the Wiggler then calms down, shrinks, and leaves the Power Star for Mario, saying that the stars he can now see through his roof at night are enough for him. The shrunken Wiggler will walk around for a moment and then fall through one of the many holes in the floor, either into the abyss or onto a platform (the arena itself is located directly above the cave featuring Wiggler's 8 Red Coins). Like many circular things in the game, Wiggler's segments and nose are not actually modeled spheres, but flat pictures that constantly face the camera. In Super Mario 64 DS, the Wiggler's appearance is more in line with its normal look. The segments (aside from the head) still use flat textures, but have rotating spots superimposed over them (like the features of Bullies and Bob-ombs) that make them look more spherical. While it has angry eyes and veins throughout the battle, it becomes the typical red "angry" form before its final hit, after which it becomes happy. In this version, the Wiggler's segments do not cause damage, but the head will. The remake also includes a minigame known as Which Wiggler? which prominently features Wigglers. Players, with a time limit, have to choose a Wiggler with a correctly matching pattern to the one in the top screen. In the first levels, these Wigglers are sleeping and stationary, but in later levels, some move. If the incorrect pattern is chosen, the Wigglers become angry and ten seconds is deducted from the time limit. In Super Mario Sunshine, a large Wiggler first appears in Gelato Beach sleeping on the Shine Tower in the second episode, Mirror Madness! Tilt, Slam, Bam! This Wiggler is blocking light from entering the Sand Bird inside the egg, preventing the Sand Bird from hatching. Plungelos, meanwhile, are disrupting the mirrors that can shine light on the egg. Once Mario defeats the Plungelos and enables the mirrors to aim correctly at the Sandbird egg, the Wiggler is removed and allows the Sandbird egg to hatch. This apparently only enrages the Wiggler, however, since Mario encounters it again, angry and as a boss directly in the next episode, Wiggler Ahoy! Full Steam Ahead! The Wiggler attacks by attempting to charge into Mario, and train whistle sound effects can be heard. To defeat it, Mario must spray a small Dune Bud growing in the sand. When he sprays the Dune Bud enough, it explodes into certain shapes like pyramids and domes. If the Wiggler is stomping on the formation the Dune Bud created, it will flip and slide on its back. Mario must than Ground Pound on a designated segment, indicated by an arrow. When the Wiggler is hit twice, it can climb the hill and moves even faster. After being defeated, it turns into sand and dissolves, leaving behind a Shine Sprite. As indicated by its Japanese name, this Wiggler is actually an individual, being known as Boss Hana-chan (ボスハナチャン), Hana-chan being the Japanese name of Wiggler. He is also unique for being green instead of yellow, as well as not turning red when angry. Firing water at this Wiggler makes him fire steam from his nose. Wigglers return in the side-scroller New Super Mario Bros., where they can be found in World 4-4 and World 7-3. The only way to defeat them is to use a Shell, a Mega Mushroom, or a Starman, although a ground pound is able to flip them over and stun them. A small variant known as Squigglers is also introduced in this game. Furthermore, World 7-3 is notable for featuring a giant Wiggler with twenty-nine body segments, including its head. The Which Wiggler? minigame from Super Mario 64 DS also reappears. Wigglers reappear in Super Mario Galaxy. They are found in Honeyhive Galaxy, Beach Bowl Galaxy, Gusty Garden Galaxy, and Gold Leaf Galaxy. Mario can spin one or ground-pound nearby it to flip or stun it. Once it flips itself back over after a short while, or it gets jumped on without being stunned, it turns red, a vein will bulge from its head and it starts chasing Mario. However, unlike the other games, the effect is temporary, and after a few seconds, the Wiggler cools back down. A stomp when flipped or a normal ground pound on it defeats it. Wigglers also appear in the follow-up to New Super Mario Bros. just as they did in the first game. They can be defeated while Mario is under the effects of a Star, a POW Block, by using a Shell, or by sliding as Penguin Mario. However, as in their previous appearances, they are not affected by fireballs nor can they be frozen by ice balls. Wigglers appear only in World 5-2, and the game also introduces a bigger variety known as Big Wigglers. They are also immune to all hits and thus cannot be enraged. In World 5-2, they are shown crossing poison, so Mario can bounce on their backs to safely cross the water. Wigglers appear in Super Mario Galaxy 2. They act and can be defeated in the same way as in the predecessor, but some of them start out angry. They appear only in three galaxies: the Puzzle Plank Galaxy, the Tall Trunk Galaxy, and the Throwback Galaxy. While they can be defeated as normal enemies in the first and third, they act more as obstacles as opposed to enemies in the second. Also, Big Wigglers appear at the end of Supermassive Galaxy. Wigglers appear in the sequel to New Super Mario Bros., having the same roles in the predecessors. In this game, they can also be defeated by having Raccoon Mario swing his tail towards their heads. Wigglers can be found in World 3- and World 3-4. Wigglers, along with their larger variants, reappear in New Super Mario Bros. U. They appear in Soda Jungle, in Seesaw Bridge, and Wiggler Stampede. In New Super Luigi U, Wigglers appear in Wiggler Rodeo, and Big Wigglers appear in Wiggler Floodlands. Unlike past New Super Mario Bros. games, they will thrust their behinds upwards during the "bah" sections of the music. Wigglers reappear as enemies in Super Mario Maker and Super Mario Maker for Nintendo 3DS. They function the same as previous games except in the New Super Mario Bros. U game style, as they will not dance when the vocals occur. In the Course Maker, the player can put regular Wigglers or shake them to turn them into their mad red variant. Like most objects, they can be enlarged by a Super Mushroom to transform them to Big Wiggler or be given wings, which makes them jump while walking. They can be placed in Warp Pipes, Bill Blasters, Blocks, Koopa Clown Cars, Lakitu's Clouds, and on tracks. While Wigglers themselves do not appear in Super Mario Odyssey, a new variant called the Tropical Wiggler are introduced, a colorful Wiggler capable of stretching its body, appearing only in the Lost Kingdom and the Moon Kingdom. Mario can capture one to travel over the poison that fills the area. Moreover, a massive insectoid robot based on the Wiggler called Mechawiggler appears as one of the many bosses fought in the game. It is found at night in the Metro Kingdom. It has five glowing orange eyes, a cyan and pink plasma globe embedded into each segment including the head, and yellow electricity-producing rods surrounding said globes. Despite the lack of physical resemblance, Mechawiggler gets angry and charges like one after taking enough damage. Wigglers (referred to as "Caterpillars") appear throughout several episodes of the Super Mario World animated series. Here, Wigglers are portrayed as being constantly angry and possessing large fangs. 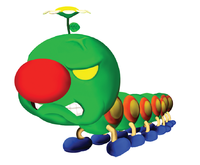 A Caterpillar first appears in "Ghosts 'R' Us" where Yoshi, while travelling with Oogtar the Caveboy through the Enchanted Forest, is attacked by a hungry Caterpillar. After running from this Caterpillar, Yoshi, after gaining a pair of Magic Wings, eats it. In "Born to Ride", after Yoshi leaves the Dome Castle and just before he meets the Dino Riders, he spots a Caterpillar and swallows it. Caterpillars are featured prominently in the episode "Party Line", which has a swarm of Caterpillars attacking Dome City while all the cave people were busy gossiping away on their new telephones. Chasing Mario and Luigi up a large tree, this swarm of Caterpillars begins trying to reach and devour them. A Caterpillar, managing to bite Mario's leg, sends him rocketing through the air, hitting a ? Block, which releases a Starman that Luigi grabs. With his new strength, Luigi tosses all the Caterpillars into the tree, which he uses as a catapult to launch the Caterpillars into space and onto a meteor, which they devour. This group of Wigglers is seen near the end of "Party Line", where they look on as the T-Rex, who had been tossed into space by a Starman powered Mario, soars by. "Mama Luigi" sees another appearance of them. A Caterpillar goes after the Baby Yoshi, who has run away again. When Luigi stomps it, and it gets up, it shows its fangs, and several more come. Yoshi quickly gets hungry, and to Luigi's surprise, devours the caterpillars. In Unjust Desserts, Magikoopa shrinks some Wigglers, and sends them into Yoshi's body after Mario, who encounters them in a passageway. Mario jumps over the Wigglers, but reaches a dead end and is cornered when the Wigglers start backing up. If Mario has picked up a wrench, he can escape from them by using it to open a valve, closing it immediately after jumping through it. Some more Wigglers appear later in the palace garden, after all the creatures (Mario included) that Yoshi and Luigi have eaten are ejected from their bodies. In Brain Drain, some Wigglers are spotted prowling around the WMUSH radio station after Iggy Koopa takes it over, and they will give chase to Luigi if he steals some Fungus Up cola from the Synapse Switcher. In the book's best ending, Iggy's mind ends up in the body of a Wiggler after he activates the Synapse Switcher without putting a protective helmet on first. In Super Mario Adventures, Mario and Luigi encounter a Wiggler while hiding from Yoshi (who they think is trying to eat them). When Luigi realizes he is sitting on the Wiggler and panics, Mario jumps on the Wiggler's head, which only makes it angry. The Wiggler starts chasing them until they run into Yoshi, who gobbles it down. Wigglers are also seen among the crowd later in the story when Bowser is ready to marry Princess Peach. Wigglers make an appearance in Hotel Mario in Morton's Wood Door Hysteria Hotel. Unlike in other games, all segments except for the head can damage Mario. Thus, Mario or Luigi must stomp on its head to damage it and cause it grow shorter as the next segment becomes its new head until no segments remain. 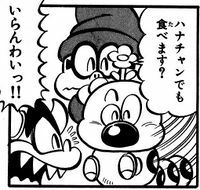 Wiggler appears in issue 6 of Super Mario-Kun. 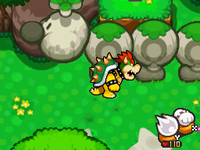 Kamek and Bowser find an otherwise harmless Wiggler and they enrage it by removing its flower. After, they plant something on its head, which resembles a Muncher. While enraged, the Wiggler fights Mario, Luigi, and Yoshi. Meanwhile, it transforms into a giant egg that hatch into moth with a more insect-like appearance. After Yoshi defeats it, Yoshi removes the nipper plant from its head, reverting it to normal. The Wiggler, still enraged, pursues Bowser. Wigglers appear as a common enemy in the Forest Maze in Super Mario RPG: Legend of the Seven Stars. They crawl in and out of tree stumps during this area. Jumping on them in the overworld releases Coins and causes them to move faster, often releasing a Frog Coin if stomped enough times in a row. Additionally, some Wigglers can be found sleeping in the Forest Maze's caves; jumping (outside of battle) on some of these undefeatable Wigglers angers them, making them launch Mario up out of the caves. Finally, Wigglers are notable for having six feet rather than eight in Super Mario RPG, while their artwork for that game depicts them with the traditional number of eight. Furthermore, Dr. Topper asks a "How many feet do Wigglers have?" question in Bowser's Keep that includes answers such as "six" and "eight", and the correct one is the non-traditional six. In Super Mario World: Mario to Yoshi no Bōken Land, Mario and Luigi arrive at the Forest of Illusion, and they notice Wiggler as it pops out of the flower patch to greet them and show them half a fruit. It turns out to be an Apple, and Luigi gives the Wiggler a whole apple in exchange for directions. A Wiggler that is very different from the normal Wiggler (being a furry, green Wiggler) known as the Fuzzy Wiggler appears in Yoshi's Story. The Fuzzy Wiggler turns blue when stomped on, and once it is defeated, it drops a Melon. First appearing in Mario Party 2, Wigglers have made infrequent appearances throughout the Mario Party games, usually as friendly and helpful non-playable characters or as characters in the background. Wigglers are sometimes obstacles, however, and one is even a boss in Mario Party 9. 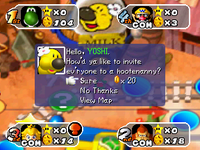 A Wiggler appears in the Western Land board in Mario Party 2 as the owner of a Milk Shop. When players pass by, they have the option to give it 20 Coins to start a hootenanny. If the player accepts the offer, then all the other characters come to the shop for a hootenanny, which brings everyone to the character. In Mario Party 3, in the minigame Picture Imperfect, Wiggler's face is one of the three main faces the players must assemble. In Mario Party 5, Wigglers appear in the form of the Wiggler Capsule. It can be tossed onto the board, but costs 20 coins if a player wishes to use it on themselves. Activating the orb results in a Wiggler appearing on a flower, asking the player if they want to be taken to the Star Space. If the player accepts the offer, it transforms into a Flutter and flies the player to the Star. This function is similar to the Magic Lamp in the previous games. In Super Duel Mode, Wiggler Tires, designed after Wiggler's body type, are slow, but easily-controllable tires that also enable the kart to turn in place. Super Wiggler Tires, which are blue, trade even more speed for more control. 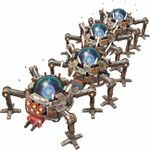 There is also a Wiggler Engine, which also trades speed for more control, and a more extreme variant, the Super Wiggler Engine. The Wiggler Capsule once again appears in Mario Party 6, albeit the name having been changed to Flutter Orb. It retains the same effect it had in the previous game, and it costs 30 coins at the Orb Shop. Wigglers have appeared as background characters in Garden Grab at day and in the Decathlon Park. There is a few props based on Wiggler, one being a roller-coaster in Slot Trot and a merry-go-ground in Stage Fright. The Flutter Orb reappears in Mario Party 7, once again keeping its effect and price from the previous game. Wiggler makes a minor appearance in Mario Party 8 as one of the cards available in Cardiators. It appears with its enraged look, and it deals eight points to the opponent. A Wiggler makes an appearance as a friendly character in Mario Party DS and has a board entitled Wiggler's Garden. In Story Mode, a Piranha Plant terrorizes its garden. Wiggler then asks Mario and friends to defeat the Piranha Plant. After defeating it, Wiggler rewards the heroes with the first Sky Crystal, and the heroes continue their quest for the rest for Bowser's Castle. A Wiggler's face also appears as one of the traceable faces in the minigame Double Vision. The Wiggler Friend badge is unlocked with 17,000 Mario Party Points, and the Wiggler Figure can be earned if the player collects 18000 Mario Party Points. In Mario Party 9, a Wiggler appears as the boss of the board Toad Road. It is faced in the minigame Wiggler Bounce, which involves the players trying to defeat Wiggler as it romps around the area. Stomping it on a purple section earns the player one point, and stomping the red section earns the player three. When Wiggler's health reaches its midway point, it begins to move faster. The Wiggler is also one of the minions imprinted on Bowser's Dice Block in Bowser's Block Battle. If Wiggler is rolled, then it appears on the arena and wanders around it three times before leaving. There is also a vehicle based on the Wiggler called the Wiggler Wagon. It can be purchased through the Museum for 200 Party Points. Wiggler also appears in the credits, though it appears shorter than the one faced in the minigame. A Constellation under the name, "Killer Caterpillar", is based on a Wiggler. Wigglers appear in Mario Party: Island Tour as obstacles in the minigame Quickest Cricket. Another Wiggler can be seen walking on ground of the Kamek's Carpet Ride board. A roller coaster attraction based upon a Wiggler appears in Mushroom Park in Mario Party 10. Wheelin' and Wigglin' in Mario Party: Star Rush features vehicles based on Wigglers. Characters start with a long vehicle, but lose Wiggler segments if enemies flank and collide with them. Players with the most segments on their vehicles win. In Leafboard Hoard, normal Wigglers and angry Wigglers are obstacles the player must avoid. They are also unaffected by jumps unlike in most games. If the player contacts one, the player is flattened and stunned for a while. In Mario Party: The Top 100, the same roller coaster based on Wiggler reappears in the minigame, Slot Trot from Mario Party 6. Wigglers appear in Super Mario Party in a couple minigames. It is the main subject in the minigame Don't Wake Wiggler! While it is asleep, players take turns petting it for points. Wiggler shows some warning signs of waking up eventually. The player who wakes Wiggler loses all points, and the Wiggler chases the other players that do not have as many points as the winning player. A Wiggler can also appear in Rattle and Hmmm, walking across the stage. A green bus that closely resembles the Wiggler from Super Mario Sunshine, known as the Wiggler Wagon, appears as a moving obstacle on the Mushroom Bridge and Mushroom City racing tracks. Crashing into it will send the racer tumbling, making them lose all items that they had, along with the rear character dragging behind for a little while. According to early screenshots, it seems multiple Wiggler Wagons were planned to appear on Mushroom City. A Wiggler appears as a boss in the unlockable seventh mission set. Mario must race him on GCN Mushroom Bridge, and each lap he gets faster. The first lap he is regular, the second lap he has steam rising from his head, and the third and final lap he is angry and red. He takes the shortcut on the last lap. Mario must use item boxes that contain Super Stars and Mushrooms to avoid getting hurt and go faster in order to win. This Wiggler is likely intended to be the one from Super Mario 64 and Super Mario 64 DS, due to the other bosses in the game being borrowed from the latter. Two giant Wigglers appear briefly as stage hazards in Maple Treeway. They casually walk around on one of the treetops, and don not seem to go out of their way to stop racers, yet running into them brings racers to an immediate halt. However, in a tournament held in September of 2010, a Wiggler appears in Wario's Gold Mine, where the racer must attempt to avoid hitting him as they race around the course. On the last lap, the Wiggler gets mad and turns red, chasing the racer around the course at twice his normal speed. Wiggler makes its first, and currently, the only playable appearance in the Mario Kart series on the Nintendo 3DS title, Mario Kart 7, where its signature symbol is its face. It has the same appearance as Mario Power Tennis and Mario Super Sluggers, but when it is driving, it has one less body segment, four hands, and only two feet. It is unlocked by placing first in the 150cc Leaf Cup. It is one of the four new racers to be participating in the Mario Kart series, along with Lakitu, Metal Mario, and Honey Queen. If Wiggler is being played as, and gets hit with an item or runs into an obstacle, it will get angry and turn red temporarily, though this doesn't affect gameplay. This trait is unique to Wiggler in the entire Mario Kart series. Wiggler is a Cruiser-type racer, and as a result, its speed, weight, and off-road stats get an above average boost. As well, whenever it gets a speed boost, its top pair of arms spread out. The Big Wigglers from Wii Maple Treeway return along with the course. They jump when they get hit by a Super Star or a Bob-omb. A Wiggler appears as a mini-boss at Chucklehuck Woods in Mario & Luigi: Superstar Saga. It is fought while Mario and Luigi are looking for Chuckola Fruits, and is first encountered sticking out of a small hole in the wall. Mario and Luigi jump on it segments, knocking it into the hole. After the Wiggler enters the hole, Mini-Mario tries to enter the hole, but runs away after seeing the enraged Wiggler. The Wiggler then engages Mario and Luigi in a battle. In battle, the Wiggler can be damaged only after all of its segments are attacked, temporarily calming it and allowing Mario and Luigi to damage its head. Any attacks to the head that does not defeat it simply enrages it, causing it to stomp and create a shock wave that can damage Mario and Luigi. Its normal attack is to charge directly ahead, allowing for its segments to be stomped on. After it is defeated, it runs away crying, and it is not seen again. In Mario & Luigi: Superstar Saga + Bowser's Minions, Wiggler drops Flower Pants upon defeat. While a normal Wiggler does not physically appear in Mario & Luigi: Partners in Time, a Swiggler appears as one of the earlier boss battles, a Shroob (alien) variant of the Wiggler that is fought in the Vim Factory. The Swiggler regularly drinks glasses of green goo that contain Vim energy drained from the past Mushroom Kingdom's Toad population. The Swiggler attacks by extending tubes from its hind-gut which plug into Shroob saucers flying overhead, which use the Swiggler's supply of Vim to shoot beams of energy at Mario, Luigi, and their baby counterparts. The quartet can attack Dr. Shroobs that appear to assist the Swiggler, knocking the mushrooms they hold into the drink, which has a varying effect on the alien Wiggler depending on what mushroom was put in the drink. In Mario & Luigi: Bowser's Inside Story, in Dimble Wood, Bowser can find statues that resemble Wigglers. If Bowser hits one in the correct order, it will move and clear a path for Bowser to move on. A giant Wiggler appears as the boss of Dimble Woods. This Wiggler works as part of the Wiggler Family farm along with a Squiggler. 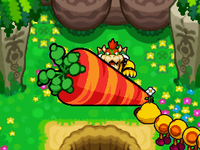 Bowser first meets him after he pulls up the Giga-carrot, a family heirloom, which is blocking the Wiggler's burrow. The Wiggler is enraged, though Bowser shows indifference and asks the Wiggler if he has a Banzai Bill. Wiggler responds that he does and has tended to it ever since it has fallen in his land. Wiggler, however, then demands that Bowser eat the carrot. As soon as Bowser finishes the carrot, the Wiggler, who has apparently forgotten his command, yells at Bowser for destroying generations of hard work and care by eating the carrot and then attacks him. In battle, Wiggler is able to use an array of different moves this time. 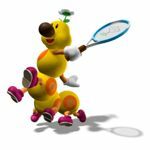 The most noticeable attack is seen when Wiggler stands up straight and his front pair of feet morph into hands, reminiscent of his appearance in Mario Power Tennis (below). He then gets a watering can and waters the ground, making a giant Turnip grow there. Two Leaf Guys then pull up the Turnip and hover above the battle on the top screen, waiting to drop it on Bowser as an attack; Bowser is able to inhale the Leaf Guys and the Turnip will drop. Later in the game, a Wiggler appears to block the Bros. route. It tells them that after all that has happened to the wood, it is not letting anyone pass without authorization. When it notices that the Bros. are collecting Attack Pieces, it tells them to 'take responsibility' and collect six. Once they manage to do this, it lets them pass. The first sage and guardian of the first Star Cure, Durmite, resembles a cross between a blue Birdo and a Wiggler. A Wiggler (known as Wiggly in the Prima guide) appears in Mario & Luigi: Dream Team as a boss on the outskirts of Wakeport. He first appears when Mario and Luigi arrive at Wakeport during their search for the Ultibed parts in the least-urban area of Wakeport, where he talks about his plans to make a flower garden aloud. Popple is nearby watching Wiggler under the assumption that he was a security guard hired by the collector who lives in the house he is currently attempting to break into. 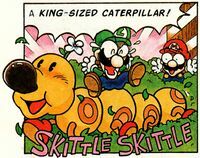 After Mario and Luigi arrive and are spotted by Popple, he enrages Wiggler by calling him a moth and drags the Bros. into a battle against him. After being defeated by mainly Mario and Luigi as Popple hindered them throughout the battle, Popple turns on Mario and Luigi attempting to take down, failing and as a result getting defeated himself and knocked into a daze. After both parts of the battle, Wiggler, while in a meager amount of pain, questions the motives of Popple and restates his intention of making a flower garden while doing so. Popple, realizing this only now, becomes outraged and insults Wiggler's intentions. He enrages Wiggler once more, and is chased away by him, now with plans to get off the island. At the very start of battle, Popple climbs on top of Wiggler and pulls the flower on his head, turning him hostile and making him lift his front half into the air to slam it down soon after. Depending on which Bro. Wiggler is in line with before slamming down, it sends out a shock-wave that the Bro. who is in line with him must jump over first, the other having to shortly afterwards. After several rounds of this, Wiggler flings Popple into the air, him eventually landing on the Bro. Wiggler was lined up with last. The targeted Bro. must counter this onto Wiggler with his hammer. Wiggler may also do this attack outside of his enraged state several times, but for each shock-wave, both Bros. must jump over it simultaneously before it hits them to avoid it, as Wiggler is in line with a spot between the Bros. As Wiggler is not enraged, Popple is not on Wiggler, and thus he does not get flung off afterwards. Wiggler can charge at a Bro. he lines up with beforehand, the Bro. having to jump on or over Wiggler to avoid taking damage. Regardless of the result, Wiggler will come charging back to his starting position from behind the Bros., this time Popple approaching the next targeted Bro. and clinging on to them (unless they have the Dizzy status in which case he won't at all), making them jump as if they were carrying a defeated Bro. If Popple is left unattended during battle when he approaches Wiggler a turn beforehand, he will in some form (this deciding which enraged attack Wiggler will do) attack Wiggler and enrage him, causing him to perform a different range of attacks for that turn. Wiggler will re-perform his opening attack if Popple climbs on to Wiggler and pulls the flower on his head again. If Popple jumps into Wiggler's face, he will skid back a bit, then walk backwards off-screen to reappear enraged from the background, where he will then chase the trio, Mario running on the left, Popple in the middle and Luigi on the right. Wiggler will line up with a Bro. from behind and run towards them faster than he normally does, the Bro. having to jump over or on Wiggler to avoid taking damage. While Wiggler lines up with a Bro., Popple may ram them from the side unless they jump over or on to Popple. Getting hit will result in the Bro. losing his running pace and thus getting trampled by Wiggler. Any Bro. who takes damage in this attack will no longer be in this round of the attack. After several rounds or when both Bros. get hit, the attack will end, and it will be the brothers' attack turns. A Wiggler appears again in Mario & Luigi: Paper Jam. He has a similar role to the Wiggler in Paper Mario: Sticker Star, however, he does not refer to himself in third person as much as the Wiggler in this game does. Mario and Luigi find Wiggler famished in Gloomy Woods and feed him a berry, replenishing his energy. Starlow explains that Paper Kamek used his magic to create piles of trash to block their path. Wiggler, outraged that someone took advantage of his weak state and made a mess of his forest, becomes mad and smashes the rubbish in front of him. The trio finds Wiggler with no energy again, who cannot move unless they feed him 10 berries. After the brothers feed him the berries, he tells them he has a craving for a dessert. Coincidentally, a Yellow Yoshi declares he has found a melon, which Wiggler explains is one of his most favorite desserts, and also refuses to move from the spot he is until they feed him his treat. The trio asks the Yoshi for the melon, but he says no, rather challenging them to a race with the melon as the winning prize. When Mario, Luigi, and Paper Mario beat him, he hands over the melon, which they feed to Wiggler. Wiggler realizes Paper Kamek left more piles of trash and smashes through them. The three help Wiggler by disabling the electric fences Bowser and his henchmen use to block the path with. The trio spot Wiggler confronting Paper Kamek, when he uses his magic to make Wiggler big and hostile, and they engage the three in a battle. After they win, Paper Kamek flies away while Wiggler apologizes saying he didn't know what got into him and passes out, shortly being carried of by Paragoombas. The heroes and Starlow mourn over the loss of Wiggler, but he returns in the form of a butterfly and offers to take them to the peak of Mount Brrr. He remains in this form for the rest of the game. A Wiggler appears as a major character in Paper Mario: Sticker Star. In 3-1, Leaflitter Path, he is sleeping and guarding the entrance of his treehouse. Upon being woken up by Mario via the Trumpet thing, he explains his predicament and asks Mario to come over to his house to hear the details. He then exclaims how he would love for Mario to "look at Wiggler's picture diary" and "listen to Wiggler reminisce". However, while doing this, he is captured by Poison Bloopers and subsequently split into pieces by Kamek (or, as he calls, his "children"). It is later revealed that Kamek did this as a means to dissuade Mario from attempting to get the purple Royal Sticker, as Wiggler is the only entity besides a boat that is capable of travelling to the island where the Royal Sticker was located. Wiggler was sleeping outside of his home because he could not find any food. Since the leaves were polluted, he set out to find food. When Mario finds his segments, Wiggler helps him to get to the source of the pollution, which is revealed to be the purple Royal Sticker on Gooper Blooper. He later ages into a Flutter and helps Mario and Kersti get to Bowser's Sky Castle. 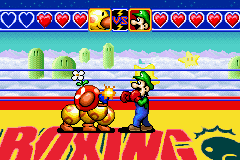 A Wiggler appears in Game & Watch Gallery 4 as the first opponent Luigi faces in the Modern mode of Boxing. Its face turns red for a second whenever it gets hit. Wiggler is an unlockable character in this game, marking first playable role. Unlike in other appearances, this Wiggler's body is curved upwards and has two gloved hands to hold a tennis racket. It is a defensive type, like Waluigi. It has the best reach in the game, but its swing ends slowly, and it lacks power and speed. Its power shot is Anger Management, where it becomes mad and spins and hits the ball. Receivers that do not use their defensive power shot are knocked back and spun in a tornado, making lunges difficult. Its defensive power shot allows it to morph into a Flutter and fly to get the ball. If Wiggler wins, it becomes overjoyed and becomes a Flutter, but when it loses, it transforms into its angry form. As with all characters, this Wiggler has a trophy-winning sequence. Luigi and Diddy Kong present Wiggler its trophy, but Diddy Kong accidentally kicks a tennis ball which causes Wiggler to trip. Diddy Kong and Luigi anticipate its anger, but Wiggler notices its trophy and calms. Luigi goes to it to see if Wiggler is okay, but Diddy then trips on the ball, falling onto both Luigi and Wiggler. Luigi and Diddy Kong then panic and flee as Wiggler turns red with anger and begins to chase them. In Super Princess Peach, a Wiggler serves as the boss of Fury Volcano, the fourth world of the game. It attacks by becoming angry and sending rocks down while running back and forth, some of which contain crystals. To defeat it, Peach has to use Rage to push a spring underneath the platform down. It flips the Wiggler over and shows a weak spot, which Peach needs to jump on. After three hits, the Wiggler spews out smoke from the flower on its head that damages Peach gradually unless she uses the Joy Vibe to blow it away. After landing two more hits, Wiggler is finally defeated and another Toad is rescued. Wiggler appears as a playable character in Mario Super Sluggers. Wiggler is a team player for Yoshi's team, the Yoshi Eggs. In Challenge Mode, he acts as a roller coaster in Yoshi Park, but has lost his temper and speedily races on the track. Mario must change the direction of the rails in order to steer Wiggler off the track and calm him down. Afterward, he joins Mario's baseball team. Wiggler has above average batting and running speed, but below average pitching and fielding. Wiggler uses Angry Attack as his special ability, which he knocks his opponent in a successful close play. Wiggler has a similar appearance as in Mario Power Tennis, having one pair of arms to hold his glove or his particularly small bat. Wiggler shares good chemistry with Blooper, King Boo, and Petey Piranha and is also not known to have any bad chemistry with any characters. A Wiggler appears in Mario Golf: World Tour owning the Wiggler Park course. It appears on Hole 1 of the course, and if the player hits it with the ball it will turn angry. Its name can also appear on the tournament scoreboard. Wigglers have made a few minor appearances, mostly cameos and name-only references in a few media. Wigglers are referenced in the Super Mario Bros. motion picture, which features a taxi cab company known as "Wiggler". Wiggler appears in Super Smash Bros. Brawl as a sticker and trophy, and in Super Smash Bros. Ultimate as a support spirit that equips the user with a Lip's Stick at the start of battle. A tennis racket Mii gear based on Wiggler is available in Mario Tennis Open. Finally, Wiggler does not make a physical appearance in Mario Kart 8, but an ATV based on one called the Wild Wiggler can be used as a body and is one of only 4 ATVs in the game. Wiggler graphics exist unused in Super Paper Mario. Its nose is orange rather than brown, making it more so resemble a Flutter. It also wears black shoes. A Wiggler can be found walking across the top of a railway tunnel in Lego City Undercover. 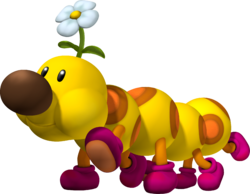 Wigglers, since their initial incarnation in Super Mario World, are depicted as large, yellow caterpillars with large brown noses, with a small flower on their head, wearing shoes. Wigglers also have orange spots scattered throughout their bodies, and the patterns of these orange spots are variable, emphasized in the minigame Which Wiggler?. When Wigglers are angry, they sometimes lose either their flower petals as in New Super Mario Bros. Wii or even the entire flower as in Super Mario Maker. In other instances, however, such as in Mario & Luigi: Dream Team, the flower is intact. Wigglers in Super Mario World and New Super Mario Bros. games are generally about half Mario's height and have five segments, including the head. Wigglers have made a few varied appearances, however. Wigglers in the Super Mario World cartoon are shown to be completely red, have sharp teeth, and be more hostile than the ones in the game. The Wiggler in Super Mario 64 is golden-colored and lacks spots, although its appearance in the remake has been revamped to resemble the more common depiction of Wigglers. In Super Mario Sunshine, the Wiggler is also different from the usual ones, being green and much larger than Mario. Finally, some Wigglers have arms to allow them play baseball as in Mario Super Sluggers, tennis as in Mario Power Tennis, and even boxing in Game & Watch Gallery 4. In these incarnations, they wear gloves instead of shoes. Gloves and shoes, however, may be interchangeable since the Wiggler in Mario & Luigi: Bowser's Inside Story is directly shown transforming his shoes into hands. The size and amount of segments can also vary. For instance, the Wiggler in Paper Mario: Sticker Star towers over Mario, an official size chart shows a Wiggler (without the flower) as roughly as tall as Mario, and Wigglers are huge as obstacles in Mario Kart Wii and Mario Kart DS. Wigglers can be shown with much more segments such as in Mario Party 9, in New Super Mario Bros., and in Hotel Mario (though they can be shortened in Hotel Mario). Wigglers, though still capable of hurting Mario and his allies, are usually shown to have a calm and gentle disposition by their ambling appearance, but they are easily angered and become aggressive. For instance, the Mario Party DS badge for Wiggler describes them as "easily vexed" and Wiggler's offensive Power Shot in Mario Power Tennis is "Anger Management". While stomping them usually provokes them, Wigglers appear to ignore fireballs and bigger Wigglers ignore Mario completely. Some Wigglers already appear angry such as in Super Mario Galaxy 2, Mario Party Star Rush, Mario Party 8, and Super Mario Maker to serve as faster-moving obstacles for the player. There are some Wigglers, as other common enemies, that can be friendly and even helpful. A number of Wigglers have been allies, and in cases including in Mario Party DS and Paper Mario: Sticker Star, they have requested Mario and his friends to help. Bowser is not often shown directly commanding Wigglers as he does with Goombas and Koopa Troopas, although in Mario Party 9, Bowser can create a Wiggler for a boss fight and can also spawn a Wiggler in Bowser's Block Battle. In some games, it shows that Wigglers have a fond talent for gardening and planting vegetables, even to the point of having a family farm grow plants for generations. One instance is in Mario Party DS, where a Wiggler tends a garden that is attacked by a Piranha Plant. In Mario & Luigi: Bowser's Inside Story, one even uses this talent in battle with Bowser. 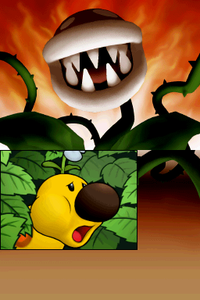 Like Luigi, Wigglers can be upset if someone bullies them or ridicules their love for vegetables or gardening, as shown in Mario & Luigi: Dream Team, when Wiggler chases off Popple when he calls Wiggler's intentions for making a flower garden stupid. Wigglers are frequently encountered in forests and jungles in most games since their debut in Super Mario World (where they are found in Forest of Illusion) including, but not limited to Forest Maze, Soda Jungle, Leaflitter Path, Maple Treeway, and Chucklehuck Woods, though some are also found underground such as in Tiny-Huge Island in Super Mario 64 and in World 5-2 in New Super Mario Bros. Wii. Psychopath "I'm just a helpless wiggler..."
Level 16 Notice: Stats in parentheses are from the game's Easy Mode. Wiggler A large caterpillar characterized by a flower on its head and a huge nose. Wigglers typically just walk around minding their own business, with no hint of malice. However, they lose their flowers when jumped upon and fly into a rage, turning bright red and chasing Mario. In Yoshi's Island, certain Wigglers appear as butterflies, with grown wings and flight capabilities. Wiggler Wiggler loves the garden and all the wonderful greenery that lives there. Except for that Piranha Plant, which makes Wiggler stomping mad! Win 18000 MP Points. Wiggler Friend 17,000 MPP earns you the rank of Wiggler Friend, and this is your badge! It makes you easily vexed. Killer caterpillar: A constellation that calls to mind a gigantic caterpillar. Rumor has it that a ride upon his back is more comfortable than you'd think. "Big, yellow, and wiggly, this creature worms his way around the track." "Hitting the road for the first time, Wiggler is a debut driver with a competitive nature. This is one caterpillar that can’t be accused of crawling along!" Guide: "Wiggler shares the characteristics of lighter heavyweights like Donkey Kong and Rosalina. This racer has a short fuse, so try not to fall behind!" Wigglers move in the funniest way. Their name really suits them, don't you think? Pretty easygoing normally, they get downright angry if you mess with that flower on their head. They move faster, which means only one thing— more wiggling! These wiggly fellows are usually pretty easy-going. Just don't mess with the white flower on their heads - that makes them rather cross. Actually, given that they turn red and start charging around twice as fast, you could say they go totally berserk. If you see one go into double-time-wiggling mode, you might want to stand back a bit. Who is your Mushroom Kingdom BFF? This giant caterpillar-looking creature seems like an easygoing friend... until it gets all steamed up! For this subject's image gallery, see Gallery:Wiggler. Spanish Floruga Pun on flor (Spanish for "flower") and oruga (Spanish for "caterpillar"). Italian Torcibruco Pun on torcere (Italian for "to twist") and bruco (Italian for "caterpillar"). Portuguese Lagartola From lagarta (caterpillar) and tola (dumb, foolish). Kkotchungi 꽃 means "flower", 충 (蟲 in Chinese) is "worm". Huā Zhī Zǐ From 花 (flower) and 毛毛蟲 (caterpillar). This page was last edited on April 18, 2019, at 09:20.